Our expertise covers all steps from engineering to biophysical characterization and X-ray structure determination of challenging proteins with interest in pharmaceutical and biotechnology research. We put our expertise and equipment at the disposal of the scientific community through a biophysics and crystallographic facility, which is part of the Integrated Screening Platform of Toulouse (PICT). Part of our research activity is dedicated to the fight against mycobacterial diseases where our goal is to structurally characterize enzymes essential for mycobacterial physiology. These enzymes represent potential targets for the development of new anti-tuberculosis drugs. Major programs are about mycolic acid biosynthesis, deciphering the molecular programming of polyketide synthases, and chaperone-mediated control of toxin-antitoxin systems. Collaborations: M Daffé and C Guilhot (IPBS); P Genevaux (LMGM). We also develop several projects related to the characterization of new protein families. This research area has seen its importance markedly increased over the years as a result of the development of our macromolecular crystallography facility. A major project deals with the structural characterization of g-tubulin complex proteins and their interactions with protein partners. Collaborations: A Merdes (CBD); A Milon/P Demange (IPBS). Several projects dedicated to the structural characterization of enzymes used for the biotransformation and valorization of agricultural resources and for the biotransformation of synthetic molecules are underway. Our major goal is to contribute to improving stability, selectivity, specificity and kinetics of enzymatic catalysts through the study of their structure-function/activity relationships. Collaboration: M. Remaud-Simeon (LISBP). 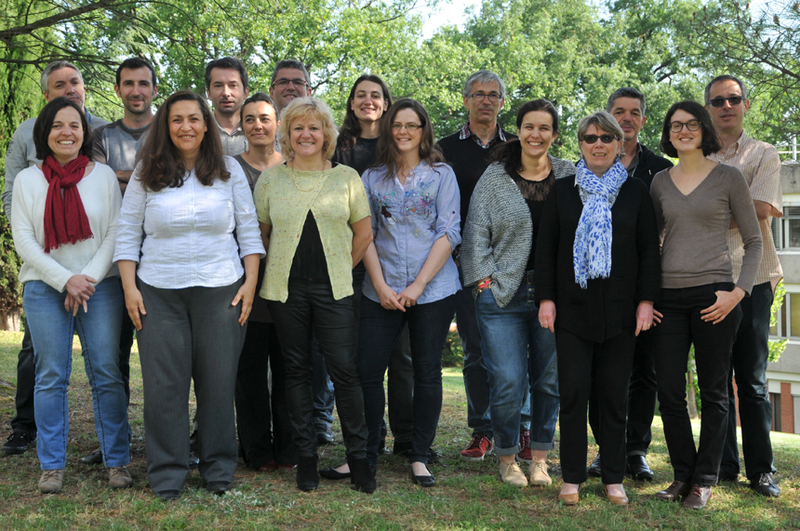 Through the IPBS expertise in bioinformatics, biophysics and structural biology, we have developed the PICT platform, one of the French techological platforms in structural biology and for ligand screening. Several ongoing projects involve the IPBS facilities in biophysics, NMR and x-ray crystallography anchoring our group in a strong ligand development activity. Ribbon representation of selected structures solved by the group within 2014-2019. Journal name and year of publication as well as PDB entry codes are indicated. Pons, B.J., Bezine, E., Hanique, M., Guillet, V., Mourey, L., Chicher, J., Frisan, T., Vignard, J., and Mirey, G. (2019). Cell transfection of purified cytolethal distending toxin B subunits allows comparing their nuclease activity while plasmid degradation assay does not. PLoS One 14:e0214313. Massemin, A., Cabantous, S., Waldo, GS, & Pedelacq J.D. (2019). High−throughput isolation of soluble protein domains using the bipartite split−GFP system. Methods in Molecular Biology, in press. Pedelacq, J.D., Waldo, G.S., & Cabantous, S. (2019). High−throughput protein−protein interaction assays using split−GFP complementation. Methods in Molecular Biology, in press. Guillet, V., Bordes, P., Bon, C., Marcoux, J., Gervais, V., Sala, A.J., Dos Reis, S., Slama, N., Mares-Mejía, I., Cirinesi, A.-M., Maveyraud, L., Genevaux, P., and Mourey, L. (2019). Structural insights into chaperone addiction of toxin-antitoxin systems. Nat Commun 10:782. Pedelacq, J.D., Nguyen, M.C., Terwilliger, T.C. & Mourey, L. A comprehensive review on Mycobacterium tuberculosis targets and drug development from a structural perspective. In Structural Biology in Drug Discovery: Methods, Techniques, and Practices (Renaud, J.P., Ed), Wiley. In press. Daudé, D., Vergès, A., Cambon, E., Emond, S., Tranier, S., André, I., and Remaud-Siméon, M. (2019). Neutral Genetic Drift-Based Engineering of a Sucrose-Utilizing Enzyme toward Glycodiversification. ACS Catalysis:1241-52. Gervais, V., Muller, I., Mari, P.O., Mourcet, A., Movellan, K.T., Ramos, P., Marcoux, J., Guillet, V., Javaid, S., Burlet-Schiltz, O., Czaplicki, G., Milon, A., and Giglia-Mari, G. (2018). Small molecule-based targeting of TTD-A dimerization to control TFIIH transcriptional activity represents a potential strategy for anticancer therapy. J Biol Chem 293:14974-88. Chollet,A., Maveyraud, L. , Lherbet, C., and Bernardes-Génisson, V. (2018). An overview on crystal structures of InhA protein: Apo-form, in complex with its natural ligands and inhibitors. Eur J Med Chem 146:318-343. Menchon, G., Maveyraud, L., and Czaplicki, G. (2018). Molecular Dynamics as a Tool for Virtual Ligand Screening. Methods Mol Biol 1762:145-78. Sala, A.J., Bordes, P., Ayala, S., Slama, N., Tranier, S., Coddeville, M., Cirinesi, A.-M., Castanié-Cornet, M.-P., Mourey, L., and Genevaux, P. (2017). Directed evolution of SecB chaperones toward toxin-antitoxin systems. Proc Natl Acad Sci U S A 114(47):12584-12589. Verges, A., Barbe, S., Cambon, E., Moulis, C., Tranier, S., Remaud-Simeon, M., and Andre, I. (2017) Engineering of anp efficient mutant of Neisseria polysaccharea amylosucrase for the synthesis of controlled size maltooligosaccharides. Carbohydr Polym 173, 403-411. Maveyraud, L. (2017) Strategies for Tackling Drug Resistance in Tuberculosis. in Drug Design: Principles and Applications (Grover, A. ed. ), Springer Singapore, Singapore. pp 89-112. Cukier, C. D., Tourdes, A., El-Mazouni, D., Guillet, V., Nomme, J., Mourey, L., Milon, A., Merdes, A., and Gervais, V. (2017) NMR secondary structure and interactions of recombinant human MOZART1 protein, a component of the gamma-tubulin complex. Protein Sci 26:2240-8. Faille, A., Gavalda, S., Slama, N., Lherbet, C., Maveyraud, L., Guillet, V., Laval, F., Quémard, A., Mourey, L.* , Pedelacq, JD. * (2017). Insights into Substrate Modification by Dehydratases from Type I Polyketide Synthases. J Mol Biol 429:1554-69. Bordes, P., Sala, A.J., Ayala, S., Texier, P., Slama, N., Cirinesi, A.-M., Guillet, V., Mourey, L., and Genevaux, P. (2016). Chaperone addiction of toxin–antitoxin systems. Nat Commun 7:13339. Brison, Y., Malbert, Y., Czaplicki, G., Mourey, L., Remaud-Simeon, M., and Tranier, S.* (2016). Structural insights into the carbohydrate-binding ability of an alpha-(1—>2) branching sucrase from glycoside-hydrolase family 70. J Biol Chem 291:7527-40. Ceccato, L., Chicanne, G., Nahoum, V., Pons, V., Payrastre, B., Gaits-Iacovoni, F., and Viaud, J. (2016). PLIF: A rapid, accurate method to detect and quantitatively assess protein-lipid interactions. Sci Signal 9:rs2. Cukier, C.D., Maveyraud, L., Saurel, O., Guillet, V., Milon, A., and Gervais, V. (2016). The C-terminal region of the transcriptional regulator THAP11 forms a parallel coiled-coil domain involved in protein dimerization. J Struct Biol 194:337-46. Guillet, V.*, Galandrin, S., Maveyraud, L., Ladevèze, S., Mariaule, V., Bon, C., Eynard, N., Daffé, M., Marrakchi, H., and Mourey, L.* (2016). 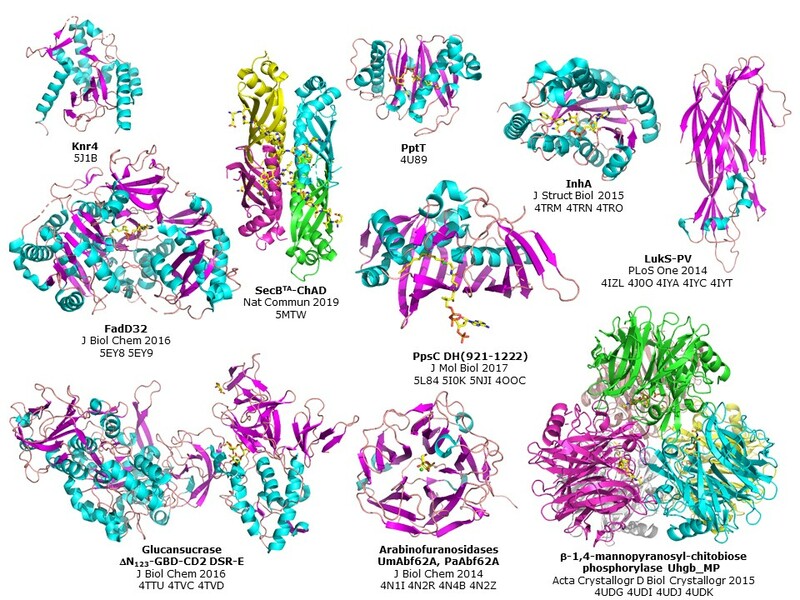 Insight into structure-function relationships and inhibition of the Fatty Acyl-AMP Ligase (FadD32) orthologs from mycobacteria. J Biol Chem 291:7973-89. Le, N.H., Molle, V., Eynard, N., Miras, M., Stella, A., Bardou, F., Galandrin, S., Guillet, V., Andre-Leroux, G., Bellinzoni, M., Alzari, P., Mourey, L., Burlet-Schiltz, O., Daffe, M., and Marrakchi, H. (2016). Ser/Thr phosphorylation regulates the Fatty Acyl-AMP Ligase activity of FadD32, an essential enzyme in mycolic acid biosynthesis. J Biol Chem 291:22793-805. Martin-Yken, H., Francois, J.M., and Zerbib, D. (2016). Knr4: a disordered hub protein at the heart of fungal cell wall signaling. Cell Microbiol 18:1217-27. Zerbib, D. (2016). Bacterial cell envelopes: composition, architecture, and origin. In Handbook of Electroporation, D. Miklavcic, ed. (Cham: Springer International Publishing), pp. 1-20. Chollet, A., Mourey, L., Lherbet, C., Delbot, A., Julien, S., Baltas, M., Bernadou, J., Pratviel, G., Maveyraud, L.* and Bernardes-Genisson, V. (2015). Crystal structure of the enoyl-ACP reductase of Mycobacterium tuberculosis (InhA) in the apo-form and in complex with the active metabolite of isoniazid pre-formed by a biomimetic approach. J Struct Biol 190:328-37. Gros, C., Fleury, L., Nahoum, V., Faux, C., Valente, S., Labella, D., Cantagrel, F., Rilova, E., Bouhlel, M.A., David-Cordonnier, M.H., Dufau, I., Ausseil, F., Mai, A., Mourey, L., Lacroix, L. and Arimondo, P.B. (2015). New insights on the mechanism of quinoline-based DNA methyltransferase inhibitors. J Biol Chem 290:6293-302. Julien, S., Tondl, P., Durand, F., Dagkessamanskaia, A., van Tilbeurgh, H., Francois, J.M., Mourey, L., Zerbib, D., Martin-Yken, H., and Maveyraud, L.* (2015). Crystallographic studies of the structured core domain of Knr4 from Saccharomyces cerevisiae. Acta Crystallographica Section F 71:1120-4. Ladeveze, S., Cioci, G., Roblin, P., Mourey, L., Tranier, S.* and Potocki-Veronese G. (2015). Structural bases for N-glycan processing by mannoside phosphorylase. Acta Cryst D 71:1335-46. Martinez, T., Texier, H., Nahoum, V., Lafitte, C., Cioci, G., Heux, L., Dumas, B., O’Donohue, M., Gaulin, E., and Dumon, C. (2015). Probing the functions of carbohydrate binding modules in the CBEL protein from the oomycete Phytophthora parasitica. PLoS One 10:e0137481. Sabourdy, F., Mourey, L., Le Trionnaire, E., Bednarek, N., Caillaud, C., Chaix, Y., Delrue, M.-A., Dusser, A., Froissart, R., Garnotel, R., Guffon, N., Megarbane, A., Ogier de Baulny, H., Pedespan, J.M., Pichard, S., Valayannopoulos, V., Verloes, A. and Levade, T. (2015). Natural disease history and characterisation of SUMF1 molecular defects in ten unrelated patients with multiple sulfatase deficiency. Orphanet J Rare Dis 10:1-31. Deng, X., Petitjean, M., Teste, M-A., Kooli, W., Tranier, S., François, J.M. and Parrou, J.L. (2014). Similarities and differences in the biochemical and enzymological properties of the four isomaltases from Saccharomyces cerevisiae, FEBS Open Bio 4:200-12. Gavalda, S., Bardou, F., Laval, F., Bon, C., Malaga, W., Chalut, C., Guilhot, C., Mourey, L., Daffe, M. and Quemard, A. (2014). The polyketide synthase Pks13 catalyzes a novel mechanism of lipid transfer in mycobacteria. Chem Biol 21:1660-9. Laventie, B.J., Guérin, F., Mourey, L., Tawk, M.Y., Jover, E., Maveyraud, L.* and Prévost, G. (2014). Residues essential for Panton-Valentine leukocidin S component binding to its cell receptor suggest both plasticity and adaptability in its interaction surface. PLoS One 9:e92094. Loll, P.J., Upton, E.C., Nahoum, V., Economou, N.J. and Cocklin, S. (2014). The high-resolution structure of tyrocidine A reveals an amphipathic dimer. Biochim Biophys Acta 1838:1199-207. Siguier, B., Haon, M., Nahoum, V., Marcellin, M., Burlet-Schiltz, O., Coutinho, P.M., Henrissat, B., Mourey, L., O’Donohue, M.J., Berrin, J.G., Tranier, S.* and Dumon, C. (2014). First structural insights into alpha-L-arabinofuranosidases from the two GH62 glycoside hydrolase subfamilies. J Biol Chem 289:5261-73. Vilcheze, C., Molle, V., Carrere-Kremer, S., Leiba, J., Mourey, L., Shenai, S., Baronian, G., Tufariello, J., Hartman, T., Veyron-Churlet, R., Trivelli, X., Tiwari, S., Weinrick, B., Alland, D., Guerardel, Y., Jacobs, W.R., Jr. and Kremer, L. (2014). Phosphorylation of KasB regulates virulence and acid-fastness in Mycobacterium tuberculosis. PLoS Pathog 10:e1004115. Daran, J.-C., Mourey, L., Seydoux, A.-M., and Ratel-Ramond, N. (2014). IYCr2014 in the << Midi-Pyrenees >> Region, France. Acta Crystallographica Section A 70:C1297. Cabantous, S., Nguyen, H.B., Pedelacq, J.D., Koraïchi, F., Chaudhary, A., Ganguly, K., Lockard, M.A., Favre, G., Terwilliger, T.C. and Waldo G.S. (2013). A new protein-protein interaction sensor based on tripartite split-GFP association. Sci Rep 3:2854. Cala, O., Remy, M.H., Guillet, V., Merdes, A., Mourey, L., Milon, A. and Czaplicki, G. (2013). Virtual and biophysical screening targeting the gamma-tubulin complex - A new target for the inhibition of microtubule nucleation. PLoS One 8:e63908. Galandrin, S., Guillet, V., Rane, R.S., Leger, M., N, R., Eynard, N., Das, K., Balganesh, T.S., Mourey, L., Daffe, M. and Marrakchi, H. (2013). Assay development for identifying inhibitors of the mycobacterial FadD32 activity. J Biomol Screen 18:576-87. García-Alles, L.F. and de la Salle, H. (2013). Chromatofocusing purification of CD1b-antigen complexes and their analysis by isoelectric focusing. Methods Mol Biol 960:573-83. Roblin, P., Potocki-Veronese, G., Guieysse, D., Guerin, F., Axelos, M.A., Perez, J. and Buleon, A. (2013). SAXS conformational tracking of amylose synthesized by amylosucrases. Biomacromolecules 14:232-9. Rottier, K.†, Faille, A.†, Prudhomme, T., Leblanc, C., Chalut, C., Cabantous, S., Guilhot, C., Mourey, L. and Pedelacq, J.D. * (2013). Detection of soluble co-factor dependent protein expression in vivo: application to the 4’-phosphopantetheinyl transferase PptT from Mycobacterium tuberculosis. J Struct Biol 183:320-8. Steunou, A.L., Ducoux-Petit, M., Lazar, I., Monsarrat, B., Erard, M., Muller, C., Clottes, E., Burlet-Schiltz, O. and Nieto, L. (2013). Identification of the hypoxia-inducible factor 2alpha nuclear interactome in melanoma cells reveals master proteins involved in melanoma development. Mol Cell Proteomics12:736-48. Zakaria, R., Lamsoul, I., Uttenweiler-Joseph, S., Erard, M., Monsarrat, B., Burlet-Schiltz, O., Moog-Lutz, C. and Lutz, P.G. (2013). Phosphorylation of serine 323 of ASB2alpha is pivotal for the targeting of filamin A to degradation. Cell Signal 25:2823-30. Bergeret, F., Gavalda, S., Chalut, C., Malaga, W., Quémard, A., Pedelacq, J.D., Daffé, M., Guilhot, C., Mourey, L.* and Bon, C.* (2012). Biochemical and structural study of the atypical acyltransferase domain from the mycobacterial polyketide synthase Pks13. J Biol Chem 287:33675-90. Brison, Y., Pijning, T., Malbert, Y., Fabre, E., Mourey, L., Morel, S., Potocki-Veronese, G., Monsan, P., Tranier, S.*, Remaud-Siméon, M. and Dijkstra, B.W. (2012). Functional and structural characterization of an alpha-(1—>2) branching sucrase derived from DSR-E glucansucrase. J Biol Chem 287:7915-24. Champion, E., Guerin, F.†, Moulis, C., Barbe, S., Tran, T.H., Morel, S., Descroix, K., Monsan, P.F., Mourey, L., Mulard, L.A., Tranier, S., Remaud-Simeon, M. and Andre, I. (2012). Applying pairwise combinations of amino acid mutations for sorting out highly efficient glucosylation tools for chemo-enzymatic synthesis of bacterial oligosaccharides. J Am Chem Soc 134:18677-88. Corrales, R. M., Molle, V., Leiba, J., Mourey, L., de Chastellier, C. and Kremer, L. (2012). Phosphorylation of mycobacterial PcaA inhibits mycolic acid cyclopropanation: consequences for intracellular survival and for phagosome maturation block. J Biol Chem 287:26187-99. Economou, N.J., Nahoum, V., Weeks, S.D., Grasty, K.C., Zentner, I.J., Townsend, T.M., Bhuiya, M.W., Cocklin, S. and Loll, P.J. (2012). A carrier protein strategy yields the structure of dalbavancin. J Am Chem Soc 134:4637-4645. Galy, R., Bergeret, F., Keller, D., Mourey, L., Prévost G. and Maveyraud L.* (2012). Crystallization and preliminary crystallographic studies of both components of the staphylococcal LukE-LukD leukotoxin. Acta Crystallogr Section F 68:663-67. Guérin, F., Barbe, S., Pizzut-Serin, S., Potocki-Véronèse, G., Guieysse, D., Guillet, V., Monsan, P., Mourey, L., Remaud-Siméon, M., André, I. and Tranier, S.* (2012). Structural investigation of the thermostability and product specificity of amylosucrase from the bacterium Deinococcus geothermalis. J Biol Chem 287(9):6642-54. Lamsoul, I., Erard, M., van der Ven, P.F. and Lutz, P.G. (2012). Filamins but not Janus kinases are substrates of the ASB2alpha cullin-RING E3 ubiquitin ligase in hematopoietic cells. PLoS One 7:e43798. Leblanc, C., Prudhomme, T., Tabouret, G., Ray, A., Burbaud, S., Cabantous, S., Mourey, L., Guilhot, C. and Chalut, C. (2012). 4’-Phosphopantetheinyl transferase PptT, a new drug target required for Mycobacterium tuberculosis growth and persistence in vivo. PLoS Pathog 8:e1003097. Perrody, E., Cirinesi, A.-M., Desplats, C., Keppel, F., Schwager, F., Tranier, S., Georgopoulos, C. and Genevaux, P. (2012). A bacteriophage-encoded J-domain protein interacts with the DnaK/Hsp70 chaperone and stabilizes the heat-shock factor sigma(32) of Escherichia coli. PLoS Genet 8:e1003037. Song, L., Siguier, B., Dumon, C., Bozonnet, S. and O’Donohue, M.J. (2012). Engineering better biomass-degrading ability into a GH11 xylanase using a directed evolution strategy. Biotechnol Biofuels 5:3. Cortes, J., Barbe, S., Erard, M. and Simeon, T. (2011). Encoding molecular motions in voxel maps. IEEE/ACM Trans Comput Biol Bioinform 8:557-63. Garcia-Alles, L.F.*, Collmann, A. Versluis, C., Lindner, B., Guiard, J., Maveyraud, L., Huc, E., Im, J.S., Sansano, S, Brando, T., Julien, S., Prandi, J., Gilleron, M., Porcelli, S.A., de la Salle, H., Heck, A.J.R., Mori, L., Puzo, G., Mourey, L.* and De Libero, G. (2011). Structural reorganization of the CD1b antigen-binding groove for presentation of mycobacterial sulfoglycolipids. Proc Natl Acad Sci U S A 108:17755-60. Garcia-Alles, L.F.*, Giacometti, G., Versluis, K., Maveyraud, L., de Paepe, D., Guiard, J., Tranier, S., Gilleron, M., Prandi, J., Hanau, D., Heck, A.J.R., Mori, L., De Libero, G., Puzo, G., Mourey, L. and de la Salle, H. (2011). The crystal structure of CD1e reveals a groove suited for lipid exchange processes. Proc Natl Acad Sci U S A 108:13230-35. Guillet, V., Knibiehler, M., Gregory-Pauron, L., Remy, M.-H., Chemin, C., Raynaud-Messina, B., Bon, C., Kollman, J.M., Agard, D.A., Merdes, A. and Mourey, L.* (2011). The crystal structure of gamma-tubulin complex protein GCP4 provides insight into microtubule nucleation. Nat Struct Mol Biol 18:915-19. Lamsoul, I., Burande, C.F., Razinia, Z., Houles, T.C., Menoret, D., Baldassarre, M., Erard, M., Moog-Lutz, C., Calderwood, D.A. and Lutz, P.G. (2011). Functional and structural insights into ASB2alpha, a novel regulator of integrin-dependent adhesion of hematopoietic cells. J Biol Chem 286:30571-81. Lockard, M.A., Listwan, P., Pedelacq, J.D., Cabantous, S., Nguyen, H.B., Terwilliger, T.C. and Waldo, G.S. (2011). A high-throughput immobilized bead screen for stable proteins and multi-protein complexes. Protein Eng Des Sel 24:565-78. Pedelacq, J.D. *, Nguyen, H., Cabantous, S., Mark, B.L., Listwan, P., Bell, C., Friedland, N., Lockard, M., Faille, A., Mourey, L., Terwilliger, T.C. and Waldo, G.S. (2011). Experimental mapping of soluble protein domains using a hierarchical approach. Nucleic Acids Res 39:e125.